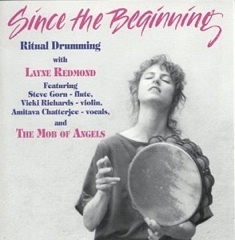 Hand Drummer Layne Redmond steers this haunting seven song CD through mystical territories with music that conjures visions of long forgotten rituals and distant cultures. Redmond, a former student of Glen Velez, combines percussion instruments such as windwands, tambourines, kalimbas, and bodhrans with flutes, violins, singing and spoken words to create a dramatic textural landscape on Since the Beginning. Highlights include Redmond’s harmonic singing on “Breath of the Sun” where she holds a fundamental pitch, and controls and amplifies the note’s inherent series of overtones by manipulating her mouth. The drumming by Redmond and her women’s drumming ensemble is precise and articulate. Since the Beginning is about how people can work and play together, not about blowing chops. Sit back, close your eyes, and drift away. 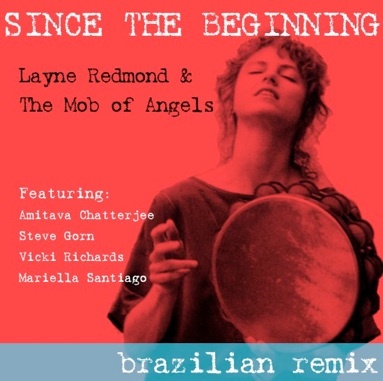 Reviving the ancient Mediterranean traditions of womens ceremonial drumming and ritual celebration, Redmond and her Mob of Angels play a whole variety of frame drums along with Tibetan singing bowls and the occasional flute. The result is a distinctively feminine sense of the drum which is ancient and powerful. The recording sweeps the listener along through seven aural soundscapes which, though many times reminiscent of the New Age style recordings, convey a much more authentic sense of wonder. This is probably due to the earthy nature of the drums and the welcome lack of synthesizers. An unusual and graceful entry into this drumming collections.